Material Replacement Examples |Precision Machining of Ceramics, Quartz, Tungsten & Molybdenum | Top Seiko Co,. Ltd.
Top Seiko has rich experience in precision machining ultra-hard materials including Advanced Ceramics, Fused Silica Glass, and Borosilicate Glass as well as refractory metals such as Tungsten, Molybdenum, and Tantalum. As part of our comprehensive machining service, we offer material selection assistance to help our customers choose best material that suits their purpose and fits in their budget. Plastics and traditional/conventional metals such as iron, aluminum, stainless steel, can be replaced with Ceramics or Refractory Metals for superior performance including: higher heat resistance, higher or lower heat conductivity, better wear resistance, improved dimensional stability under heat, and more benefits. We are the expert of machining these high performance ultra-hard materials to tight tolerances. Below is a selection of actual cases of successful material replacements. Burn mark problem solved by using Fused Quartz as a component material. Our customer had been troubled with burn marks which occurred on the surface of the acrylic laser-transmitting component during laser welding process. Since burn marks were causing the reduction of laser transmission, the component had to be grinded twice a week to remove them. Our engineers helped our customer replacing the material of the component from acrylic to fused quartz for its excellent thermal and optical properties. Thanks to the high heat resistance of fused quartz, grinding is no longer necessary. Moreover, because there is no more laser transmittance loss caused by burn marks, laser output power is reduced. Thermal deformation problem solved with Machinable Ceramic. Aluminum thermal bonding fixtures deformed at working temperature of 250℃, and poor bonding quality and/or defective products were being produced as a result. Our engineers recommended to replace material from aluminum to machinable ceramic. Thanks to higher thermal stability of the machinable ceramic, fixtures no longer deform and bonding yield has improved by approximately 20%. Using Zirconia as cutting tool material increased the tool life. utting tools made of Tool Steel were used to machine metals. Heat generated during machining caused excessive tool wear. Therefore, the tool had to be replaced frequently, causing downtime each time. “It was very costly as well as time wasting”, our customer complained. Since Zirconia has excellent wear resistance, we decided to make the cutting tool in Zirconia. Zirconia improved wear quality significantly when compared to that of tool steel. “Most importantly, we can now machine metals with less downtime” , our customer appreciated. High purity Tungsten provides superior radiation shielding performance for gamma cameras. Heavy metal was used as a shielding material to protect against high-level radiation. However, insufficient radiation shielding was causing gamma cameras to break down easily. To improve radiation shielding capability, we recommended to replace shielding material from heavy metal to high purity tungsten. Thanks to its high density, high purity tungsten provided effective radiation shielding. As a result, the gamma camera with tungsten shielding was launched into production. The usage of Tungsten Heavy Metal Alloys for a positioning fixture crucial in manufacturing automotive electric components has successfully reduced the size of the fixture yet with the same required weight. Making the fixture in stainless steel would not meet size requirement. To reduce size with the same weight, a material with a specific gravity greater than 17.5 /cm3 was essential. Also, the fixture required improved chlorine and sulfur resistance in order to increase its service life. Tungsten heavy metal alloys were recommended to replace stainless steel, for its high specific gravity (18g/cm3) as well as excellent corrosion resistance. The fixture became compact in size with prolonged service life. The usage of high purity Alumina improved heat resistance of molds and significantly increased the productivity. Molds made of heat resistant resin were used to manufacture activated carbon for water purification system. However, its insufficient heat resistance for molding application was a major cause of low productivity. Because high purity Alumina can withstand high temperature up to 1,300℃, and relatively cheap compared to other ceramics, we recommended our customer to make molds in Alumina 99.5%. “Replacing mold material from heat resistant to high purity alumina has significantly improved productivity,” our customer happily told us. Metal Matrix Composites (MMC) provide optimum thermal performance for soldering nozzles. A manufacturer of soldering machines needed soldering nozzles which would not deform at high temperature and could conduct sufficient heat. They had been troubled with their soldering nozzles made of copper which deformed because of the heat generated during operation, resulting in poor soldering quality. We proposed replacing copper with MMC (Metal Matrix Composites) for its excellent mechanical and thermal properties such as high durability, low thermal expansion, and high thermal conductivity. MMC soldering nozzles conduct sufficient heat without thermal deformation, improving soldering quality significantly. This customer is now a leading soldering machine manufacturer serving mainly automotive industry. Uneven coating problem solved with Fused Silica chemical dispensing nozzles. Slit nozzles made of stainless steel warped during operation, causing uneven coating of the chemical. Our customer is very pleased with warp-free slit nozzles which provide uniform coating. This change also increased the nozzle life. Super durable Tungsten jigs / fixtures improved the productivity. Alumina jigs/fixtures could not withstand the intense heat caused during heat treatment process and were frequently cracked or broken. Tungsten was recommended to replace alumina for its exceptionally high strength at very high temperatures. Being extremely durable, tungsten jigs/fixtures enabled stable processing and significantly improved productivity. Using Molybdenum as a heat transfer material has incredibly improved bonding quality of a thermo-compression bonding device. A thermo-compression bonding device had a problem with its heater stage which was unable to conduct enough heat for a thermocouple to measure temperature accurately. The stage was made of stainless steel, a relatively low thermal conductive metal. The inaccurate temperature measurement prevented temperature control system to function properly, resulting in poor bonding quality. Because molybdenum has approximately 9 times higher thermal conductivity than stainless steel, our engineers recommended to make the heater stage in high purity molybdenum. “The molybdenum heater stage enabled correct temperature control which improved the bonding quality dramatically”, our customer told us. Warping issue solved with Silicon – Silicon Carbide Metal Matrix Composite Ceramic Material. The plate made of silicon warped during heat treatment of semiconductor wafers. We recommended replacing silicon with Si50 / SiC50 metal matrix composite ceramic material to increase structural and thermal properties of the heat treatment plate. Due to its increased rigidity and lowered thermal expansion, the plate does not have warping problem anymore. Replacing Invar with Fused Silica Glass for better thermal stability enabled reliable, accurate and stable gas analysis. The gas analyzer instrument had a problem with its critical component made of invar which expanded with rising temperature and caused unstable gas measurement. 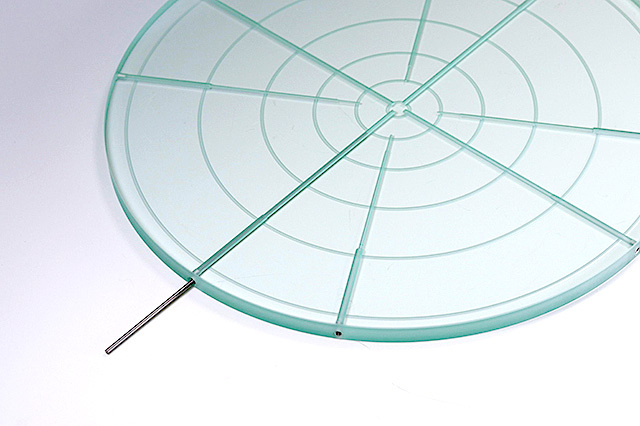 Due to the high thermal stability and excellent corrosion resistance, it was recommended to replace invar with fused silica glass. Thanks to fused silica’s very low thermal expansion, the component became thermally stable, which enabled the gas analyzer instrument to measure reliably, accurately, and stably even at high temperatures.